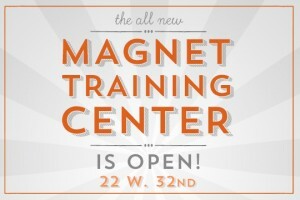 The new Magnet Training Center at 22 W. 32nd Street marks a huge development in the history of the Magnet and the New York comedy community. For the first time since most anyone at Magnet can remember, we've got all of our classes running under the same roof, bringing our community of students, teachers, and performers together on a nightly basis. It also means that more classes are being offered in improv, musical improv, sketch comedy, and storytelling than ever before and that's great news for all of New York, whether you're a comedian, actor, singer, storyteller, or audience member. Our new home has 10 classrooms, a studio theater, two dedicated writers rooms and two multi-stall bathrooms (so luxurious!). There are vending machines, a water fountain, and places to hang out before and after class. Simply put, its a bigger, better space to keep up with our growing needs as a training ground for the best comedic minds in the world. Plus, it's got a view of the Empire State Building. Pretty swanky, right? 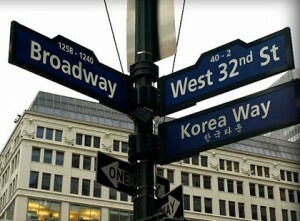 And did we mention that our new training center is right in the heart of New York City's Korea Town? 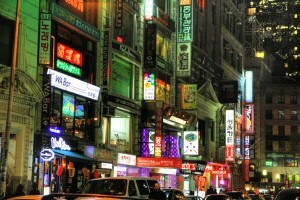 We are now smack in the middle of a block packed full of great restaurants, cool cafes, and killer karaoke bars. Whether it's a team dinner before The Circuit, or a night of singing after your musical improv class, K-Town has you covered. This is a new, exciting chapter for us and it wouldnt be possible without the enthusiasm, hard work, and continued brilliance of our students and staff. Thanks for being the best community around. If you haven't seen the new digs yet, please stop by when you can, or sign up for a class! For a sneak peak, check out the fun infomercial below.